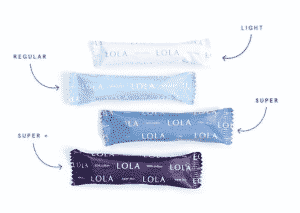 Home › Health › Is LOLA The Best Organic Tampons Brand? 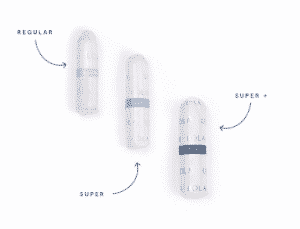 Is LOLA The Best Organic Tampons Brand? Do you know what is inside feminine care products? If you are like most women (and men), you probably haven’t spent a lot of time trying to figure out what synthetic additives, dyes and even toxins are in tampons, liners and pads. Even if you have, you might be surprised to discover that many of the so-called best tampon brands don’t tell you what is inside feminine care products. LOLA aims to provide women the best organic tampons by ensuring only 100% organic cotton is used. The feminine care company offers applicator tampons, non-applicator tampons, ultra-thin pads with wings, and ultra thin liners that are hypoallergenic and dermatologically tested. LOLA even provides a First Period Kit for girls so they are prepared with everything they might need. The nice thing about LOLA products is that delivery is automatic. Simply select your subscription box and your tampons, liners and pads are delivered monthly or bi-monthly with free standard shipping. If you want to cancel at anytime for any reason you can do so easily without penalty. And if you want to skip an order at anytime for any reason, such as when you are on vacation, you can do so easily too. The bottom line is if you are searching for all natural tampons, LOLA has the quality, price and convenience to earn it the top spot as the best organic tampons brand. What Is In LOLA Organic Tampons, Pads & Liners? How Does The LOLA Subscription Box Work? What Is The Price Of LOLA Tampons, Pads & Liners? YES! I Want Organic Tampons! LOLA tampons and pads are 100% organic and certified by the Global Organic Textile Standard (GOTS) and ICEA. Unlike many top tampon brands, LOLA tampons contain no dyes, toxins, latex, pesticides, GMOs, fragrances or formaldehyde. Tampons come in two forms: applicator and non-applicator. They are available for various absorbency levels except ultra absorbency tampons. If you are not sure how frequently to change a tampon, the FDA recommended guidelines are to replace them every 4-8 hours, and to never leave a tampon in for more than 8 hours. Both day and night pads are available. The day pads are intended for medium flows while the night pads are best for heavy flows and overnight protection. If you don’t know which might suit best, you can select a box that contains both so you can try each out. LOLA recommends switching out pads every 4-6 hours, though encourages you to choose the frequency that is best for your needs. Like LOLA organic pads, LOLA liners are made of 100% organic cotton, non-toxic adhesive, and plant-based backing. They are also free from fragrances, toxins, dyes, formaldehyde, pesticides, synthetic fibers, and latex. And like LOLA tampons and pads, they are certified by the ICEA and Global Organic Textile Standard (GOTS). Similar to LOLA pads, liners should be changed every 4-6 hours on average, though you are encouraged to switch them out as often as you need. For animal lovers, take solace knowing that LOLA liners are not tested on any animals so they are cruelty-free. A drawback for thong-wearers is LOLA does not yet provide thong liners. It is easy to get started with LOLA. The first step is to select what products you want: tampons, pads, or liners. Next, you get to choose the assortment of products you prefer, so you can mix and match to try out different absorbency levels for example. Then decide how frequently you want your box delivered. You can pick a monthly schedule or every other month depending on what works best for you. Packaging is discreet so you don’t have to worry on that front. Once you enter your shipping and billing info, you’re all set! If there was one service you would want to be charged for on a subscription basis, LOLA tampons, pads and liners delivered to your door is probably it. LOLA makes it easy to subscribe by automatically renewing your second and subsequent orders, though if you wish to skip, cancel, or modify an order you can do so easily. To leave you in no doubt, you will receive a reminder email 2 days before your order is set to renew. With the exception of the First Period Kit product, all other products are sold on a subscription basis. A bonus at LOLA is that shipping is always free so while no free samples are on offer, neither do you get hit with an exorbitant shipping cost as you might elsewhere. Plus, first time customers enjoy $5 off their first orders (no coupon code needed). LOLA offers customers greater discounts with higher volume orders and always provides free shipping. Applicator tampons are 100% organic cotton in BPA-free plastic applicators. They are hypoallergenic, unscented, compact, biodegradable and expandable (widthwise) for comfort. Non-applicator tampons are 100% organic cotton. They feature leak protection, and are also hypoallergenic, unscented, compact, biodegradable and expand widthwise. Ultra-thin pads with wings are breathable yet absorbent, discreet, dermatologically tested, hypoallergenic and feature wings for a secure fit. You can choose 12-count per box and enjoy discounts if you purchase 2 or 3 boxes. If you are having a lighter day or expecting a first period, ultra thin liners might be the best choice because they offer leak protection yet are discreet, soft and breathable. Like LOLA ultra-thin pads, they are dermatologically tested and hypoallergenic. They are made to be soft yet breathable and also feature an edge-to-edge adhesive for a secure fit. You can choose a 28-count per box selection and enjoy discounts when you purchase 2 or 3 boxes. A nice feature for first time LOLA buyers is that the $5 discount enjoyed by first time buyers does not require any coupon codes – it is applied automatically. 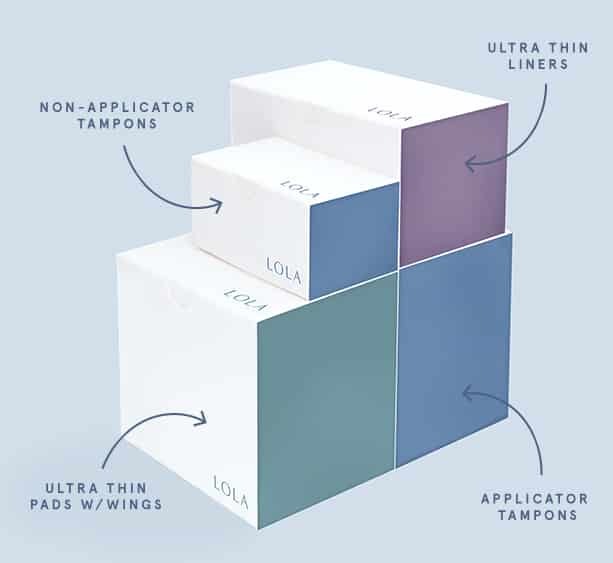 The First Period Kit at LOLA comes with 6 ultra-thin day pads with wings, 6 ultra thin night pads with wings, 10 light applicator tampons, 10 ultra thin liners, 4 instructional tear cards, 1 canvas pouch, 1 set of stickers, 1 keepsake box and a $5 credit towards a new subscription. The First Period Kit is intended for girls between the ages of 9 and 15, the typical range when a girl will get her first period. However, if you want to try LOLA for the first time, the First Period Kit offers a good sampling of products. Alexandra Friedman and Jordana Kier founded LOLA after stellar careers in the consulting world as well as other top tier startups. Both attended prestigious business schools before beginning their journey to bring all natural tampons to the masses. A feel-good factor you enjoy when purchasing LOLA is that Alexandra and Jordana have integrated a philanthropic dimension to their business so for every LOLA purchase, a menstrual product is donated to a LOLA partner, such as Support The Girls, Distributing Dignity and Simply The Basics. So, what are you waiting for? Get started with your LOLA subscription box today! ‹ Is tastyworks The Best Online Trading Platform For Day Traders?